It’s yet another quiet day at Morty’s high school, a quiet broken by the sudden announcement that Jessica, the apple of Morty’s eye, is now single. Before Morty can make a move though, Rick appears and whisks him off for another adventure, promising him it will only take 20 minutes. Six days later our dishevelled duo narrowly escape a legion of alien battleships and rewarded lavishly for their efforts. They then proceed to have a nervous breakdown on return to their ship. Realising that they can’t keep going on so many adventures so often, Rick comes to a conclusion: they need a vacation! The two head off to the ‘best day spa in the galaxy’, a place where being swallowed by a slime monster and puked back up soon leaves your whole body as soft as a baby’s behind. Nothing like being swallowed by a slime monster to rejuvenate you. After their rejuvenation, Rick and Morty try their luck with a detoxifying machine that removes all “mental toxins”. They come to in a large bog where everything looks to be covered in snot and trash, including Rick and Morty. However, Rick seems to be far more angrier than usual and Morty far more whimpy. Rick to realises that the machine didn’t malfunction at all, but worked to a snotty ‘T’ and removed our duo’s toxins: their toxic personalities! The detoxified Rick and Morty leave the spa content and relaxed to almost an unsettling degree, with Rick going so far as to apologise to the spa attendant he harassed and allowing Morty to put on slow-tempo music during their trip home. Over time things get even better, especially for Morty who’s confidence has made him the most popular kid in school. But Rick has discovered a problem. Turns out that the toxic Rick and Morty have found a way to communicate and have started sending messages to Rick’s communicator, making Rick worry they’re in pain. Morty however doesn’t seem phased. In fact he’s got himself a date with Jessica, which turns south quickly due to Morty’s inability to stop talking about himself (confidently mind you). Jessica leaves, only for Morty to start flirting with another (much older) woman, Stacey. Their meeting takes a steamy (and most certainly illegal) turn when Morty brings Stacey back to his family house, just as Rick attempts to reunite himself and Morty with their toxic doppelgangers. Not wanting to lose his newfound confidence Morty freaks out, but Rick pulls him into a re-toxifying machine regardless. But before the two can be changed, Stacey pulls Morty out, causing her to be swapped out with toxic Rick and toxic Morty. 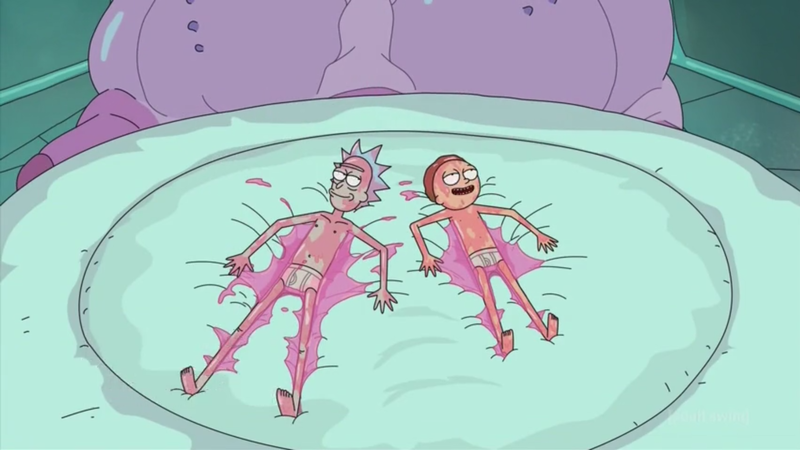 Turns out toxic Rick never planned to merge back with Rick: he was going to trap both him and Morty in the toxic world so he could be free. 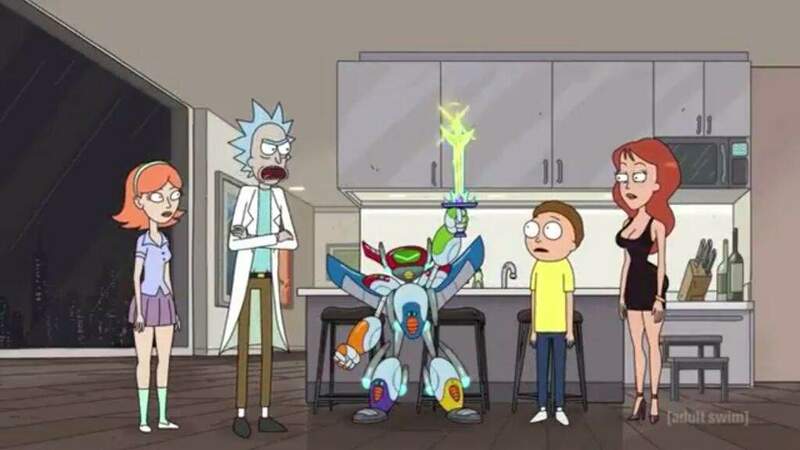 The exchange leads to a fist-fight between both Ricks, with everything from crotch turrets to a Furby monster being used to level the fight, which ends in a stalemate. Toxic Rick flees, but not before announcing his plan to make the whole world toxic. His exchange with toxic Rick makes the regular (albeit mentally healthy) Rick realise something: if toxic Rick embodies all his worst traits, then he must embody his very worst trait, i.e. irrational attachments. With this knowledge in hand, Rick and Morty fly off to confront their toxic selves, which culminates in Rick shooting Toxic Morty with a virus, deducing that if Toxic Rick really does possess Rick’s unhealthy attachments, he’ll do anything to save his Morty, including reuniting with Rick. Toxic Rick caves and the world is saved, only for Morty to chicken out and run away, not wanting to become the whimpy Morty we all know and love (?). Three weeks later, toxin-free Morty has capitalised on his lack of a conscience and become a successful Wall Street broker, with a buxom girlfriend and high-rise apartment to boot. Rick’s having none of it though and he and Jessica ambush Morty, forcefully fusing him back with his toxic self. Morty is unhappy about losing his confidence, especially when he finds out that Jessica may be seeing her old boyfriend again. He falls back into old routines as Rick arrives at his school and pulls him along on another adventure, but not before Jessica tells the boy “it’s nice to have you back.”. You can take the apartment, my money, but you’ll never have my Gundam robot! REVIEW: After the slump caused by the last two episodes, ‘Rest and Rick-laxation’ was a welcome breath of fresh (and toxic) air. This episode took a headfirst Freud and Jungian dive into the emotional and mental toxicity issues prevalent in today’s society, reaching an enlightening crescendo with Rick’s quote on the individual view of toxicity. So what if you don’t have the body of a Barbie doll? That doesn’t mean it’s a ‘toxic’ thing to be a little willowy. Who cares if you aren’t completely confident in yourself? One might argue that full-blown confidence can be even worse like Morty realised. It’s all about your perception of yourself, not the opinion of others, a lesson I’m glad finally made it’s way into Rick and Morty.